At Xintang village, Longjiang town, Shunde district, Foshan city, Guangdong province, the villagers have laid siege to the village committee building for more than two months already. 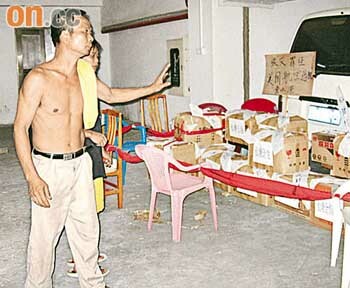 On the night before last, some village officials attempted to remove the village accounting ledgers from the village committee building, but villagers stopped them. This triggered a disturbance in which more than one thousand angry villagers took over the village committee office building. The villagers even blocked the state highway in order to draw attention to their situation. As for last night, several hundred villagers are still inside the village committee office building and they are determined to stop any village official from destroying the evidence. 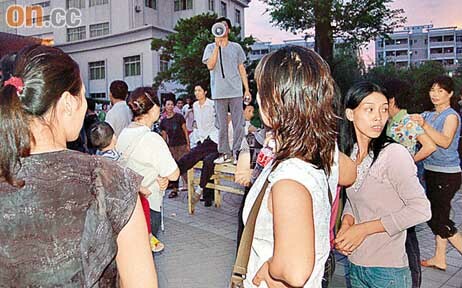 According to Xintang villagers, the demonstrations have been going on for more than two months. 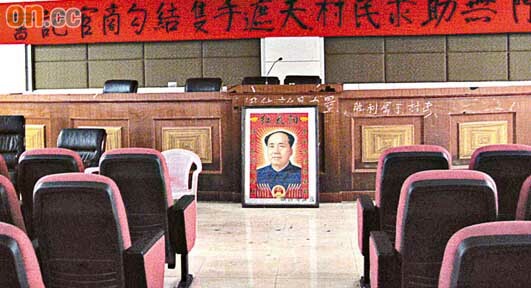 On July 2, several hundred villagers conducted a silent sit-in at the village committee office building known as Yong'an Building. They demanded the village officials to open up the account books to be reviewed by villagers. The participants were mainly the elderly women and unemployed middle-aged men of the village. They held sit-ins with banners, they disrupted business at the village committee office, they marched in the streets, they took over the village committee office building and they even started cooking for themselves inside the building. 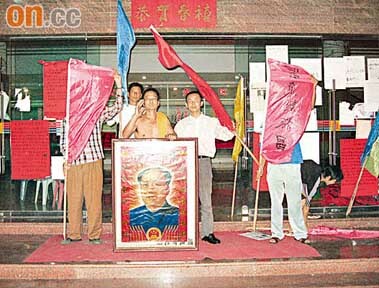 Earlier this month, the village party secretary who had been the target of criticisms resigned. The town government sent in three cadres to take over government work in the village. As a result, the villagers calmed down somewhat and the demonstrations eased up. But on the night before last, villagers found some village officials moving stuff out of the village committee office building. They stopped the men and asked to inspect the stuff. At first, the village officials claimed that the boxes contained moon cakes. When the villagers opened the boxes by force, they found out that these were the operating account books for the village committee over the last dozen years. The books showed that there had been almost 100 million yuan in revenue that the villagers had never heard of. Therefore, the villagers took possession of these account books. 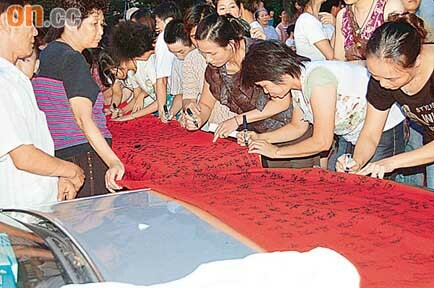 In order to stop the village officials from destroying the evidence, more than one thousand villagers surrounded the village committee office building. Some of the villagers even blocked the highway in order to draw the attention of senior Guangdong and central government officials to investigate the case. As of last night, there are still more than 200 villagers at the village committee office. The local police are on standby alert, but they have not taken any action to disperse the crowd. The town government and the village committee have not commented on the situation as yet. Villagers said that the 3,400 villagers in Xintang village used to depend on farming to make a living. Then they lost their land. The village committee did not tell them about how much revenue came from the land deal. At present, each villager receives 60 yuan from the village committee, which meant that they could not even meet basic needs.